Baked Broccoli Bites, a deliciously healthy and low-in-calorie snack or appetizer that even broccoli haters will love. These balls can be enjoyed by kids and grown-ups alike, and are super simple to make. 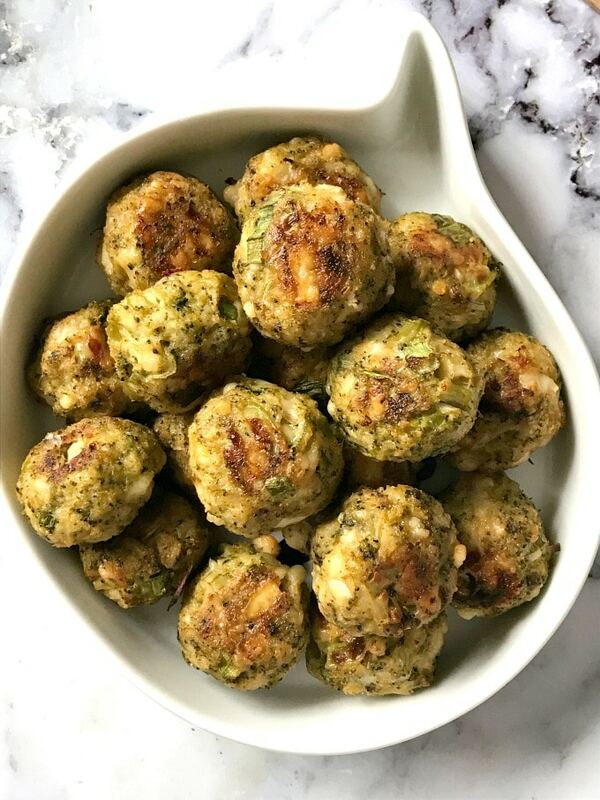 Whether you make them for a picnic, kids’ school lunch box, or simply a healthy snack in between meals, my fantastic cheesy broccoli bites are sure to please a crowd. If motherhood has taught me something, it’s that the kids’ taste buds are forever changing. My older daughter has gone from looking at most vegetables and pretty much all cooked food with disgust, to asking for broccoli for breakfast and chicken soup for lunch. I mean, seriously, who is this stranger, and what has she done with my daughter? I look at her eating like a hungry horse, and I’m all amazed. So, yes, there is hope. Never give up hope! I made these broccoli bites and I could hardly get her little hands off them for a few seconds to get these photos. She had quite a few, and then came to the kitchen again and asked for more. Meanwhile, her little sister had one, threw a few others on the floor, and then decided she wasn’t that impressed. Oh well, at least she had one. So mummy had the rest, and I must say it was hard to decide whether the broccoli bites or the Baked Veggie Tots are the best. I guess I will have to make both again to be 100% sure. 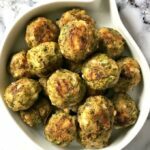 How do you make the best broccoli bites for kids? So, no frying needed here, we are talking healthy food only. No added salt either, although I guess it could be argued that the Cheddar cheese is already salty. Not massively salty, anyway. I only added a tiny little bit of black pepper, and that’s pretty much it. Yet, you get the most amazing broccoli balls, perfectly baked, with just a tablespoon of oil to grease the pan to prevent them from sticking. And that’s it! Spring onions are for added taste, but you can safely omit them. I do like spring onions though, so I whole-heartedly recommend using them. I used regular breadcrumbs, but panko breadcrumbs can be used as well. The egg gets to bind the mixture together, so not to be missed here. If you are not a fan of Cheddar cheese, feel free to use anything else you like, grated mozzarella should do too. As for the texture, they hold their shape amazingly well, but they are soft on the inside, while the outside slightly browns beautifully in the oven. Serve them with ketchup, or any sauce of your choice. Or just enjoyed them on their own, they are still super delicious. 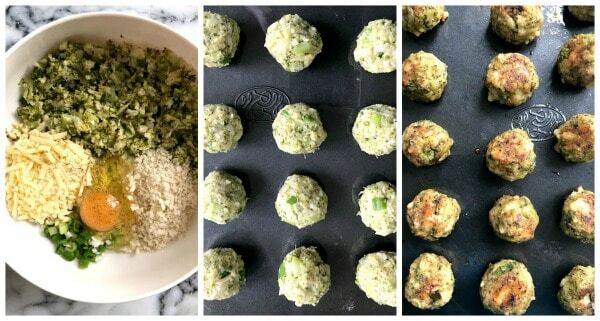 If you’ve liked my BAKED BROCCOLI BITES or any other recipe on the blog then don’t forget to rate the recipe and let me know how you got on in the comments below, I love hearing from you! You can also FOLLOW ME on FACEBOOK, and PINTEREST to see more delicious food and what I’m getting up to. Baked Broccoli Bites, a deliciously healthy snack or appetizer that even broccoli haters will love. 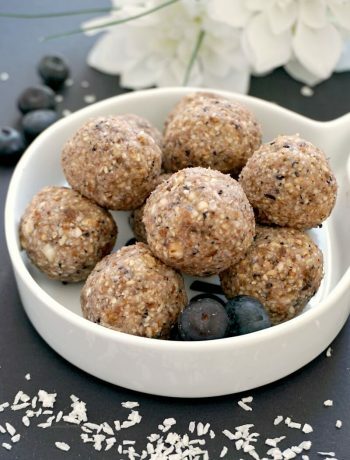 These balls can be enjoyed by kids and grown-ups alike, and are super simple to make. 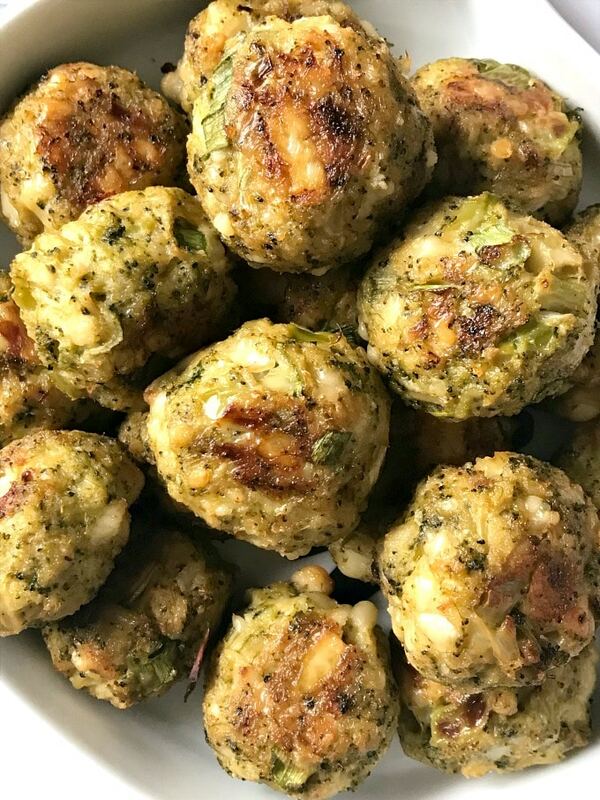 Whether you make them for a picnic, kids' school lunch box, or simply a healthy snack in between meals, my fantastic cheesy broccoli bites are sure to please a crowd. Break the broccoli head into florets, add them to a pan of boiling water, cover with a lid and leave to cook until soft, it takes about 10 minutes or less. Chop the broccoli finely, you should get about 2 cups of chopped broccoli. Leave to cool. Add the broccoli to a bowl, add the cheese, chopped spring onion, breadcrumbs, egg and black pepper, and mix everything well. Pre-heat the oven to 180 degrees Celsius (356 Fahrenheit). Grease a baking tray with vegetable oil, then shape small balls out of the broccoli mixture, I ended up with 18 balls, but depending on the size, you might get more or less. Bake for 30 minutes or until lightly golden brown, turning them on the other side half the way through baking.